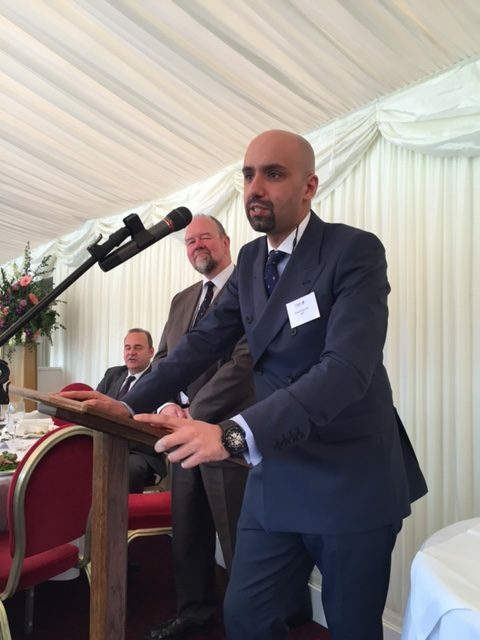 Ahmed Kashadah Managing Director of LAP speaking at the LBBC event at the House of Lords(Photo: LAP). ”The opportunities to create joint ventures in this room are vast. We believe that the planning and preparation for future investments and strategic success in Libya does not need to be undertaken on-shore in Libya’’ said Ahmed Kashadah, Managing Director of the Libya Africa Investment Portfolio (LAIP/LAP). ‘‘We acknowledge that the conditions are not currently ideal, and that security and stability remain a priority for all Libyans and our partners our partners. But from our own experience, we know that if the work is developed, devised and completed anywhere else in the world, the planning today can enable a running start tomorrow when our country can comprehensively welcome foreign direct investment’’, he added. Kashadah was giving the keynote speech yesterday at the Libyan British Business Council’s (LBBC) annual luncheon held at the House of Lords. The event was attended by about ninety leading members and guests of the LBBC interested in Libyan business affairs, including the Foreign and Commonwealth Office, Chris Cardona, the Maltese Minister for Economy, Tonio Casapinta, vice president of the Maltese Chamber of Commerce, PWC, AECOM, Mott MacDonald, KBR, Amec Foster Wheeler, BACB, ABC Bank, Aggreko etc. LAIP is one of the five subsidiaries of the Libyan Investment Authority (LIA), Libya’s sovereign wealth fund. It is charged with diversifying Libya’s economy, which is especially important in this difficult time of transition. The LIA is a consortium with over 550 companies reporting through five subsidiaries. These are located across three continents and account for some $US 67 billion of assets and investments, the majority of which are invested outside Libya. LAIP’s portfolio covers a wide range of sectors which include energy, real estate, technology, agriculture and financial asset management among others. It holds over 80 percent of its assets outside Libya across Africa, Europe, the UK and the UAE. Asked by Libya Herald if in view of the trust deficit between Libyan citizens and state institutions and the acute electricity generation, poor health, education, a housing deficit he envisioned a change in the role of LAIP in order to meet Libya’s urgent short term needs, Kashadah said that ‘‘In accordance with Libyan Law Number 13 of 2010, LAIP cannot invest in Libya without approval from the Board of Trustees of the LIA (the ultimate shareholder), but such approval was obtained for two sectors – energy and construction’’. ‘‘What makes LAIP different is the fact that, in addition to the continued safe-guarding of its assets, it has been very active post-revolution in its investment strategy. Key decisions continued to be made in areas including restructuring, mergers and acquisitions and the execution of existing strategies; all of these decisions were made during the ongoing instability Libya has faced, and have been proven to be valuable investment decisions that have increased wealth and ensured the fund’s survival’’, he explained. ‘‘The diversification of the LAIP portfolio and the strategic turnaround achieved over the past few years has taken LAIP from one of the LIA’s lowest-performing subsidiaries, to one of its highest. Let me give you two examples of the strategies that have proven to be effective. ‘‘First is the Oil Libya Holding where decisions related to changes in management and mergers and acquisitions have helped the company to become one of the leading downstream companies in the African continent’’. ‘‘Over the years, Oil Libya became a major player in Africa employing over 1,500 diverse employees, generating an estimate of 20,000 indirect jobs in the countries of operations. It is visited by up to 250,000 customers per day. It has over 1,000 service stations, eight blending plants, over 60 fuel terminals, and a presence in over 50 airports across Africa’’. ‘‘Another excellent example of the turnaround capacity of LAIP and the adherence to its diversification mandate is well illustrated by the success of the company’s investment in a satellite company’’. ‘‘RSQ is a satellite business of LAIP that went through a major restructuring; it started providing services outside the Libyan market to ensure its external survival. It proved to be successful in this, and is now looking into providing its services for Libya’s rural areas which it believes are a promising market’’. ‘‘The company’s survival was under threat as it was struggling to meet its liabilities due to its over-reliance on the Libyan market; we have successfully supported the company with our partners to develop a new business plan with a change of management. The company is now operating and benefiting from its African origin in providing its services in much wider markets in association with international brand names’’. ”Earlier I also mentioned that we have investments in the Libyan construction sector, for which we have obtained a license required by Law 13. This Libyan construction arm is relatively new but we have very high hopes for it in terms of providing its services to the demand of the local markets’’. ‘‘These are just a few examples of success that illustrate how the LIA and its subsidiaries are committed to help rebuild Libya by creating the right platform – by economically empowering its people from the outside-in’’. ‘‘The LIA aims to directly and indirectly invest its Investment Fund abroad on the grounds of economic feasibility in diverse economic areas to contribute to the development and diversity of the resources of the national economy and to achieve the best financial returns to support the public treasury. It further seeks to secure the future of the upcoming generations and to mitigate the impact of income and other state revenue fluctuations’’. ‘‘To mention one – we currently have the largest network of oil distribution in Libya under one of our subsidiaries. The company is currently suffering from the instability in the country but once the situation is stabilised, we can consider joint ventures with international partners’’, he revealed. ‘‘Similarly with our construction subsidiary’’, he continued, ‘‘the potential future demand of rebuilding the country would benefit greatly from an international partner that can ensure a transfer of knowledge and experience in this sector. And we would be proud to see you join forces with us in this endeavour’’. ‘‘The LIA’s accountability is ultimately to the Libyan people and we must continue our work, no matter what is happening in Libya. The LIA’s responsibilities are above the political fray. Because of this, we are doing business as usual until the situation in Libya is stable once more’’, he explained. ‘‘It is difficult to know when this will happen’’, he admitted, ‘‘but we remain optimistic as we continue to build partnerships and work to create a more prosperous future for all Libyans. When political stability is secured, there will be a greater opportunity for the LIA to take an even more proactive approach to investing, and we very much look forward to taking advantage of this’’, he told his audience. ‘The LIA and its subsidiaries are the right partners, and hold strong principles of governance. We are proud to have this opportunity to discuss with you all our achievements to date and explore mutually-beneficial business opportunities. We would be delighted to have you as our partner and help us to rebuild Libya’’, he concluded. It is worth keeping in mind that the chairmanship of the LIA is being contested in London’s High Court between chairmen representing the east and west of Libya. However, (article 8 of) the UN-brokered Libyan Political Agreement signed in Skhirat, Morocco in 2015 stipulates that the Presidency Council/Government of National Accord takes over all top sovereign positions, including those of the LIA. The LPA is further backed by UN Security Council Resolution 2259. The international community only recognizes the PC/GNA in Tripoli as the sole legitimate executive power of Libya yet recognizes the Tobruk-based House of Representatives (HoR) in the east as the exclusive legislature. The HoR recognizes the PC and recognizes the GNA in principle, but has refused to vote on the GNA as it considers it to be dominated by ”Islamists”. Equally, it wants Khalifa Hafter to remain as head of the army ad wants the PC/GNA to be propped up by an army as opposed to what it considers western/Islamist militias.